Vacations are of two kinds. They are formal and informal. The formal vacations are the government planned vacations regarding cultural events as well as seasonal vacations. There are some informal vacations. These occur when a student or an employee want to take days off for their personal reason. The vacations which are on person’s own consent are appealed by the respective employee. In the workplace, there are a set number of leaves for the whole year. These leaves are paid leaves. All employees can take benefit of utilizing them. Even if the employees have not utilized since the year, there is some additional benefit in the end tenure of the profession like retirements. These vacations are appealed on account of proper methodology. The statements must be accurate in these requests. Once the desired period of vacations is about to complete; a letter of intent to return to work is written. This letter can be sent in different circumstances. Such situations can be returning before the end date, returning on the exact date or returning with lesser duties for some time. This all depends on the current situation the employee is having. All letters in the workplace are always kept as a record. So these all letters must be accurate, concerning and valid as per their topic. 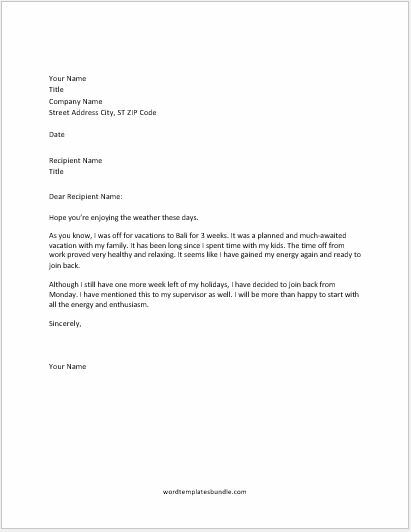 If the employee needs some changes, he needs to write the letter of return countable days before the vacations end. The details and the previously signed forms of vacations along with signatures must be attached. 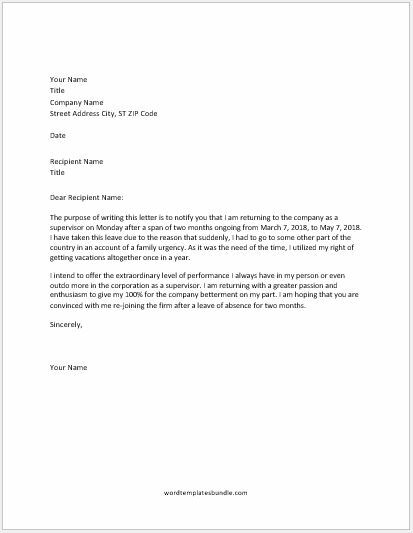 The purpose of writing this letter is to notify you that I am returning to the company as a supervisor on Monday after a span of two months ongoing from March 7, 2018, to May 7, 2018. I have taken this leave due to the reason that suddenly, I had to go to some other part of the country in an account of a family urgency. As it was the need of the time, I utilized my right of getting vacations altogether once in a year. I intend to offer the extraordinary level of performance I always have in my person or even outdo more in the corporation as a supervisor. I am returning with a greater passion and enthusiasm to give my 100% for the company betterment on my part. I am hoping that you are convinced with me re-joining the firm after a leave of absence for two months. Hope you’re enjoying the weather these days. As you know, I was off for vacations to Bali for 3 weeks. It was a planned and much-awaited vacation with my family. It has been long since I spent time with my kids. The time off from work proved very healthy and relaxing. It seems like I have gained my energy again and ready to join back. Although I still have one more week left of my holidays, I have decided to join back from Monday. I have mentioned this to my supervisor as well. I will be more than happy to start with all the energy and enthusiasm.